It comes from Australia (maybe). Hipsters like it. No one really knows what it is. On the mysterious trail of the latest must-sip beverage. Images: Shutterstock, Starbucks, and Sprudge. The first time I order a flat white, I have no idea what I’ve just asked for. Starbucks has already given me the vocabulary for the drink with advertising in its stores and on television, but I still have no clue what makes it special. There’s no mention of the flat white on the menu. As the frantic barista behind the case of cake pops and croissants asks for my order, I half expect him to not understand what I’ve just said. If he wants me to clarify, I’ll be stumped. Luckily, he only asks about the size, writes “FW” on a cup, and sends me down the line. I still don’t know what to expect when the drink arrives. The first couple of sips taste like a cappuccino—foamy espresso mixed with milk. While looking for a distinction, I settle on the way the drink keeps tasting like the first couple of sips of a cappuccino. 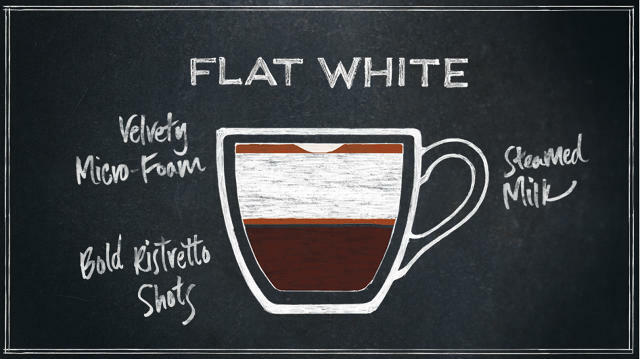 Hella very confused people are going to start ordering hella flat whites. Foam! I think to myself. It must be an espresso drink with all foam. That is what’s different. So maybe it’s the dot that differentiates it from a latte? I call a Starbucks spokeswoman to clarify. She says the type of espresso that Starbucks uses for the flat white has a more concentrated, sweeter flavor than the espresso the company uses in its other drinks. It uses whole milk by default instead of 2% milk by default, and a small size has two shots instead of one. That foam I was tasting? That’s the “micro-foam” that Venuto was talking about. Starbucks has served the drink in its Australian cafés since 2009. In January, it started introducing the drink in the U.S.
“Here’s one thing we do know,” Alex Powar, the head of quality control and education at Four Barrel Coffee in San Francisco (disclosure: I briefly worked there when I was in college), wrote in an email to baristas after Starbucks announced the flat white. “Hella very confused people are going to start ordering hella flat whites.” He included a diagram in the email showing the ratio of foam, steamed milk, and espresso in an array of trendy espresso beverages, including a flat white, a Gibraltar, a cortado, an SG-120, and a latte. Each image is exactly the same. Whatever a flat white is supposed to be, here’s one thing it most certainly is, at least at Starbucks: It’s a new product that borrows a name with some cultural weight, regardless of how closely it sticks to that culture’s definition. “There’s deep history with [coffee drink names],” says Wrage. “It’s indicative of particular places and trends. Cappuccino has deep history and tradition in Italy, but what ends up happening is when this nomenclature is appropriated by different cultures and different places, there becomes a shift in meaning with these different drinks.” Ninth Street deals with this confusion by offering “espresso and milk.” They’ll mix it however you like. When Starbucks introduced a drink made with steamed milk and vanilla-flavored syrup, finished with caramel sauce, it named it the “caramel macchiato.” To an Italian espresso enthusiast, a macchiato means something completely different: espresso with a dollop of foam. Starbucks could have gone with “candy latte,” but “macchiato” conveys the craftsmanship associated with the Italian version. Similarly, whatever the flat white is, many Australians agree that what Starbucks has made is not it. That won’t stop many American consumers from wanting to try one. It’s similar to the strategy that alcohol brands use to emphasize the quaint history of their spirits–even if those products are now mass-produced in a factory–by, say, building a 157-foot luxury yacht to retrace old maritime trade routes with the History Channel or investing $2 million to create a visitor center at an old distillery. When Starbucks first started serving lattes and cappuccinos, they weren’t commonplace in the United States. Starbucks was able to introduce them as a tradition newly arrived from Italy, even though it wasn’t long before the way Starbucks made them was much different than the way a small Italian café would. Whatever it is supposed to be, the flat white allows Starbucks the same marketing advantage, this time Australian style.